I ordered one on impulse, seeing that local stores don't stock them any more and that Anderton's were down to their last two. I assumed that the black ones are about to be discontinued like the antigua ones were (if, in a couple of months, the black are replaced by a restock of CAR or something, I'll RAEG at my own impatience). Anyway. 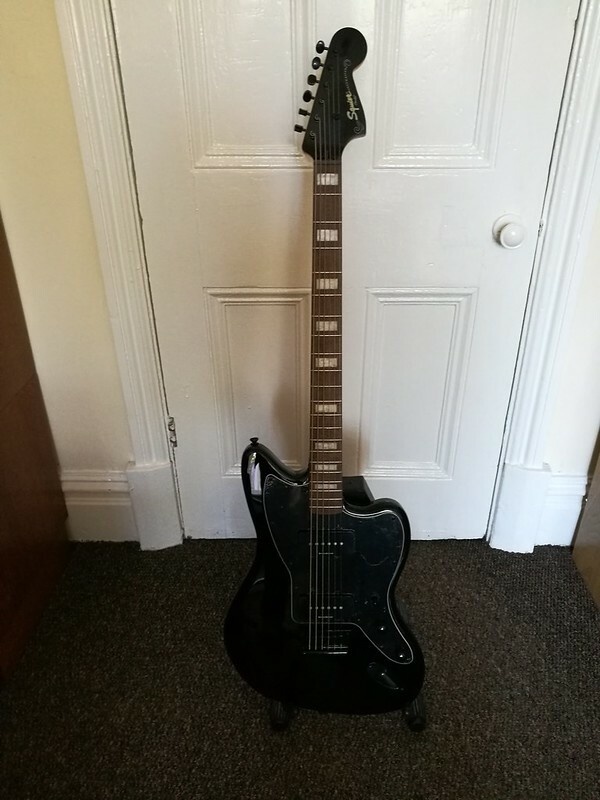 It's due for delivery on Saturday, and I expect the first thing I'll do after checking to make sure everything works properly is see if I can drill the pickguard and move the pickup selector to where it's supposed to be. The strat jack is a strange stylistic choice, although it's hardly a deal-breaker. The Danelectro-style bridge/tailpiece is the only real reservation I had, so if the screw positions allow, I'd like to swap that out for something more sturdy. Just looked it up, looks cool, didn't even know the existed! Noice. Will be interested to know what you think. Have had my eye on one of these for a while now. Antigua really isn't my thing and I'd prefer the black one to be, well, slightly less black. Assume they were going for teh metalz market with that? Given the niche nature of baritones though I doubt I'm likely to see Squier issue a sherwood green/surf green/sonic/daphne/LPB/CAR one any time soon. I'm not sure who the target market is specifically, because aesthetically it looks like Spinal Tap chose the colour scheme while sounds-wise it's not a metalhead's guitar at all. As an instrument I'd say it caters to fans of Robert Smith, Thought Forms and perhaps stoner rock with some nice muff-style fuzz. The sound is boomier and more midrange-y than is usual for a JM, but it could be those pesky 250k control pots that Squier insist on using. I have it tuned to B flat right now, to match the half-step down tuning of my "standard" JM, and it can nail the BORIS HEAVY TOANZ pretty well. It's not too badly balanced (despite a longer neck on what looks like a standard size body) and the neck profile is more of a handful without being too uncomfortable. It's the sort of "feel" that subtly encourages you to play slightly differently, so it really does give a general vibe of being its own thing, as opposed to being just a regular guitar tuned lower. Tuners are old-school vintage Fender style. 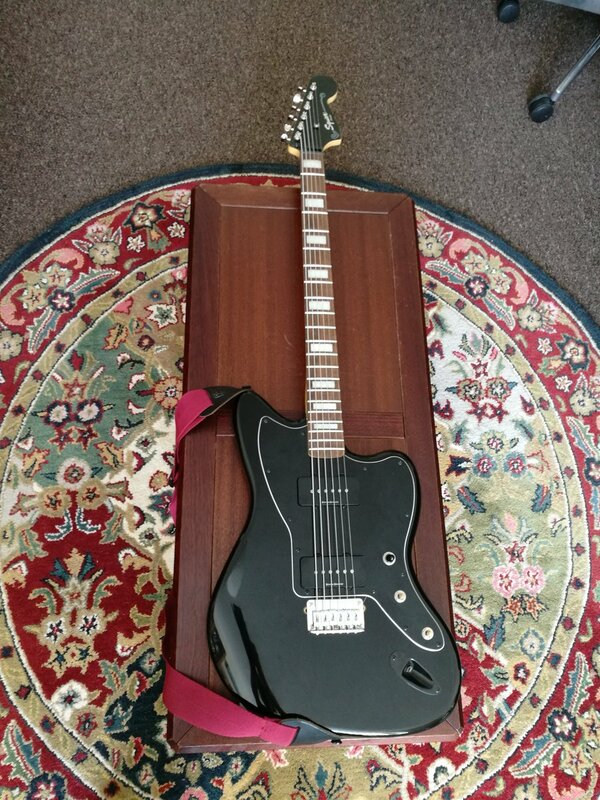 Front-of-headstock colour matching the body...at this price point? Yup! 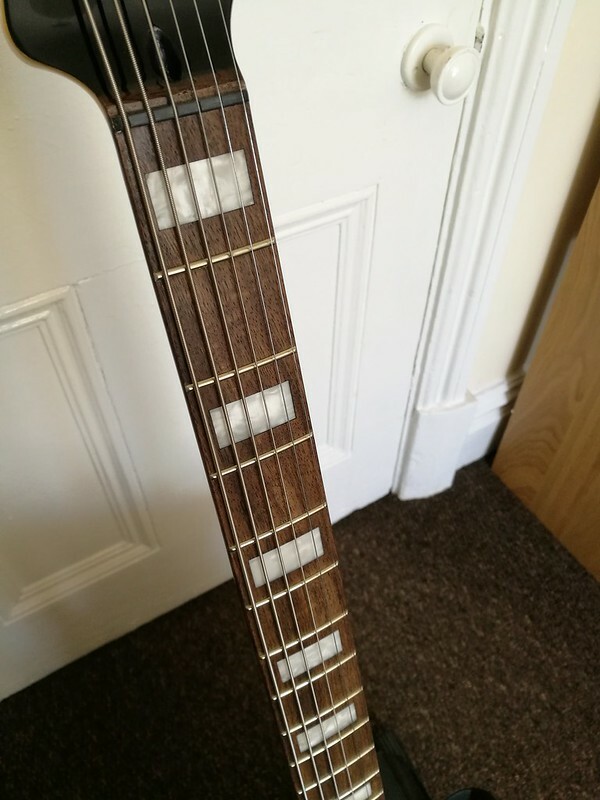 The fretboard is a wee bit dry, and looks a little pale...perhaps because of the surrounding colours? The block inlays are a nice touch, and work well with the wider fretboard spacing of the 30" scale neck. Between that and the headstock, it looks/feels a bit more expensive than it is. Overall, I'm impressed. 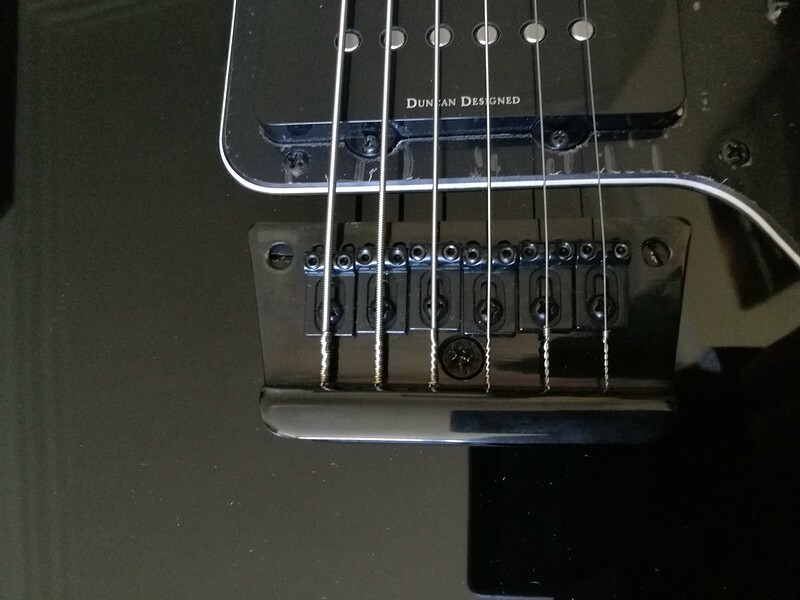 The 250k control pots are disappointing but hardly surprising, but the "Duncan designed" pickups sound nice...whether they're wound hotter/brighter than standard, I'm not sure. I'm in no hurry to swap them out. I don't mind the selector switch positioning and the strat-style jack as much as I expected either...perhaps because of the colour, they don't stand out so I'm going to leave them as-is too. The only thing I really dislike. Honestly, why they thought this was a good idea I'll never know. A top-loading hardtail bridge like the HH Mustang is simple, inexpensive and does the job fine. This bizarre Dano-style thing with a single screw at the back holding it down feels cheap, flimsy and fine-tuning the intonation is physically impossible when the strings are on. I'll have to shop around a bit to find something that lines up with the screw holes, but this thing really does have to go. Overall though: a great guitar for the price. Top loaders are okay, the old Fender Musicmasters were fine guitars. It's a bit too blacked out for my tastes but looks quality. I think even changing just the machine heads to chrome would loosen up that look. That guitar only wants to play Bauhaus covers. Maybe some Joy Division or Love and Rockets b-sides. Mezzio and I always loved Antigua. I wonder if he still has the Antigua Tele? This looks great! My OCD would need the e tuner straightened tho. I've ordered some Gotoh tuners, and will hopefully be able to tweak the alignment of the e. Now I see it, I can't unsee it. They're the same as the old ones, except they're nickel rather than black. I hope they're the same as the ones on my CIJ JM, because I really like those. Slight bit of drama with the bridge: I ordered a "top loading" hardtail, but there were no holes in the back for the strings. I was about to send it back, then noticed that the strings slot into the saddles themselves. This is a neat idea, but it really doesn't work on a low E baritone string. So I still had to order another one. PM me if you want an as-new toploading Strat hardtail bridge! Fortunately, I can probably utilise the existing rear screw hole for one of the mounting points for a new bridge, and the old mounting post holes will be partially covered by the time I'm done. It's not likely that I'll have pics of the upgrade till the weekend now. The new bridge fits okay. I utilised the retaining screw's hole for the middle of the three rear screws, so it's a couple of mm further back than I would've liked. 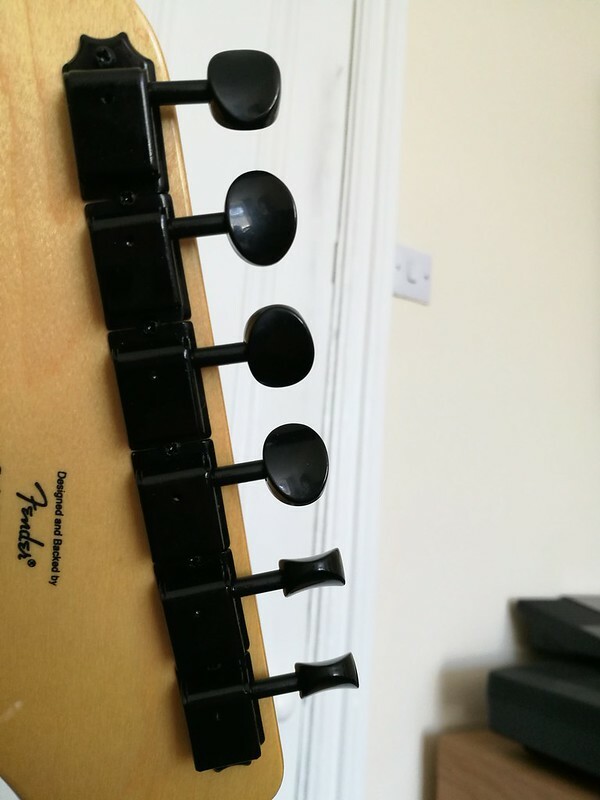 The saddle screws press against the strings on this type of top-loading bridge, but the important thing is that it intonates correctly and stays in tune. The tuners are like-for-like, but the holes weren't quite big enough for the new bushings. I used a combination of a power drill and strips of fine sandpaper wrapped around a screwdriver shaft to widen them. It took some time and patience, but I got there in the end. By the time I'd finished, I realised that the England/Sweden feetball match was over. While the strings were off and I had my Box of Bits to hand, I also swapped out the control circuitry for a pair of 1 meg Dimarzio pots and an orange drop cap that I'd put aside for an aborted JM project a few years back. I'll need some knobs that fit - right now I'm still leaning towards a pair of Tele-style chrome ones, but open to suggestions - but otherwise I think it looks better and is perfectly playable, although I'm gonna give it a day or two to let the new strings stretch out and tweak the action and intonation. The new pots retain more treble, so it sounds closer to what I'm accustomed to a JM sounding like. A weird footnote to this: the pickups have two earth wires each, which struck me as odd for single-coils. This produced a large number of earth wires, and soldering those things to the bottoms of pots is a pet hate of mine. In the end I wrapped them all around a washer inside the control cavity with some solder to keep them glued into place, which was in turn attached to one main earth wire. I dunno if this is standard practice, but it reduced the amount of fiddly soldering I had to do, and doesn't give any excess buzzing or hum. I'd call it a success! Different companies used different ground wiring methods. I've seen a washer used, can't remember who now, but when I repaired guitars for a shop quite a few companies use that central grounding method.